5.16.2016 Standing outside my studio barn, looking down, then suddenly looking up as the wind stirred the branches, face to face with hickory leaves, in a freshly poised, newly burst open pod I felt the presence, a lively plant consciousness saying to me, "We want more trees, more trees!" "How can I raise a hickory?" "You call me a hickory but I am not one plant. The mass of vegetation grows and unfolds together. Let the meadow grow wild and trees will follow." 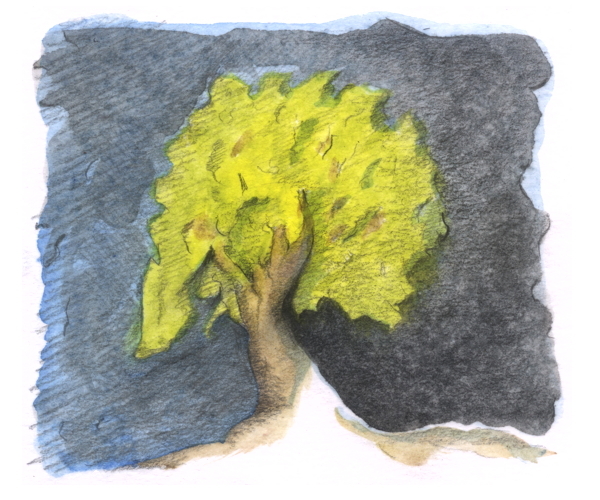 "I get it, I will try, be well – but what about your tree consciousness? What do you have to teach me?" "The leaves you see are brand new - they are babies reborn each spring. Their life has just started but the branch they are connected to has lasted many years, the trunk and roots are older still. Attention can be placed at any of these scales: the cyclical leaf, the enduring branch, and the whole tree; telling the story of what comes from the air and soil, passing through this pattern, germinated so long ago but not lasting forever.